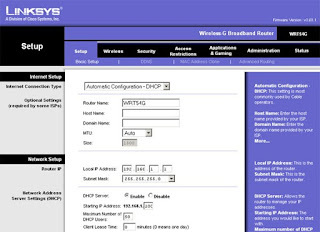 Cable broadband is as popular as DSL broadband but the steps to add a WiFi router to both connections are different. This article explains the steps to add a wireless router to a cable modem to extend the network. Modern cable modems have WiFi feature but if you are using standard one without WiFi feature, you can use this guide to add WiFi to your current home or office network. Here I use a cable modem, Linksys WiFi router, one desktop PC and a laptop to demonstrate the configuration. Without telling the current network diagram, I cannot explain the procedure. I have a cable modem connected to my desktop PC. MAC address of the Desktop is registered with my cable broadband company and I do not think they want to share the Internet connection with other devices in my home. Now I want to share this restricted Internet connection to my laptop without registering the MAC address of the laptop. I have bought a Linksys router for this purpose and want to extend the Internet to my Wireless Laptop through it. Make sure that you are able to go online through the modem. 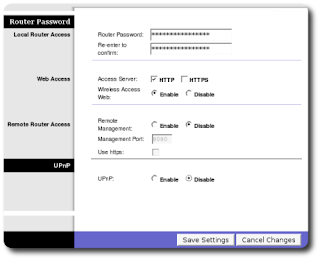 Connect the output line of the modem to the WAN port of your router. Connect the first computer to the LAN port of the router. Power on the Router and wait until the WLAN and Ethernet light are on. Open the browser window and type http://192.168.1.1 but please note that the login IP will be different for different vendors. It will ask you for username and password. Enter the default values provided by the vendor. Setup page looks like below. Under Setup, you can see the MAC address clone. Click on that. 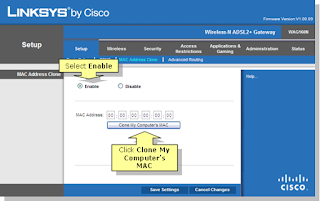 Click on clone MAC address and save settings. We need to change the default password to a good one. After typing the new password, click on save settings. Click on Wireless tab and you can give any name as SSID. You may choose wireless channel 6. Other two possible channels are 1 and 11. Now under wireless security, you can enable encryption. After saving the settings reboot the device. You have successfully configured your router with a cable modem. Right now the broadband connection from the cable ISP is shared between my laptop and desktop computer. I have bypassed the restriction to use the Internet on a single computer by cloning the MAC address of my registered computer to the router and use it to divide the connection. 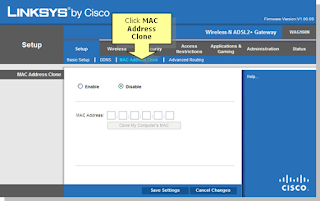 MAC address registering is an old trick played by cable broadband service providers to limit the number of devices accessing their broadband connection. I have written an article about it a few weeks ago. You can read that article by visiting the link below.